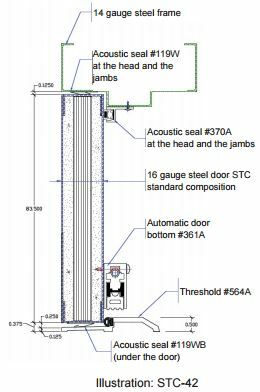 E336 Standard Test Method for Measurement of Airborne Sound Insulation in Building. E413 Standard Classification for Determination of Sound Transmission Class (STC). C423 Sound Absorption and Sound Absorption Coefficients by the Reverberation Room Method. Métalec offers complete sets including the door, the frame, the acoustic perimeter seal, the bottom seal and the aluminium treshold. Acoustic degree available: STC-36, STC-40, STC-42, STC-44. Product available with fire resistance up to 3 hours (180 min.). The frames are provided with a label indicating the Sound Transmission Classification rating (STC). A label is applied indicating the Sound Transmission Classification rating (STC).